I called it “the seaweed cardigan”. It came from this pattern, and I took a fun photo of it, with me attempting to imitate the severe look on the model’s face, because I had a similar haircut and used a similar colour yarn, see? I tried “blocking” it (and wrote all about it here), but who am I kidding, it’s acrylic, it’s not going to make a difference no matter how much I soak it and how long I stretch it. I tried anyway and to my surprise it did stretch to a shape that fit for a moment — enough time for me to take a photo. And then when I took it out again after a few weeks I realized that it had shrunk back to its sad, misshapen self. It doesn’t fit me properly so it’s really unlikely that I would wear it; I might as well use the yarn for something else I want to make. 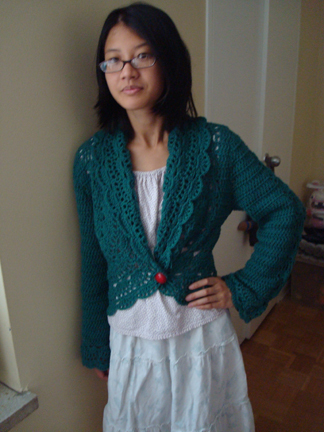 The cardigan is really a clever and beautiful design, I just didn’t use the right yarn. Perhaps I will try again using a yarn with better drape. It works for warmer weather too! The pattern itself is pretty straightforward but the way it’s written is a bit difficult to follow. I had to unravel and restart several times to understand its structure. 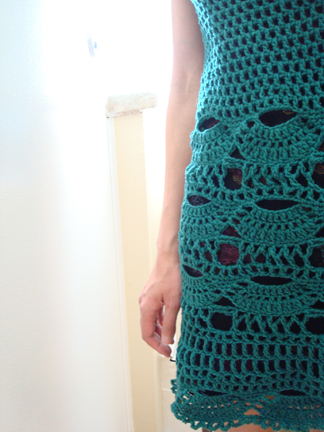 But after that I just kept trying it on as i went (a nice thing about a top‐down pattern!) and made up my own stitch count, increases, etc. Anyway, I’m quite happy with how it turned out :D Definitely something I would wear often. Sometimes (or, more often than not) I’d make a garment simply because I’m intrigued by the pattern, and once I made it I’m not that interested in wearing it. 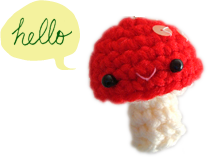 So, instead of keep buying new yarn I’ve been checking my closet to see if I can harvest any yarn for making new things.